Lightweight, compact and ambidextrous, and almost perfect for first person shooters. Ahh the Roccat Kova AIMO, a mouse with such promise, such glamour about it. It’s a far departure from the usual outlandish designs we’ve seen from the German manufacturer. But does it fit the bill? The best gaming mice come in all sorts of shapes and sizes, from the large, button heavy, MMO based Razer Naga Trinity, to the lightweight, palm hugging, Mionix Castor’s, to the excessively versatile, Razer Deathadder Elite (our top mouse). There’s a mouse for everyone, and yet they all cater to very specific niches. They need to, even our little Roccat Kova here. As the types of games we play are so diverse and so refined in their nature nowadays, for those that game in only one specific niche title, or spend thousands of hours diving into the realms of an eSport, having the right peripheral to solidly nail all of those actions each and every second is just as important as any of the PC parts powering your machine will ever be. The Roccat Kova AIMO looks to be a mouse designed with one very specific audience in mind, right or left-handed first-person shooter gamers. There are tell tale signs littered all over the design of this pesky pixel pointer. From the lightweight specs reaching just under that 100g mark, to the limited amount of buttons, resting easily within the reach of each of your fingertips, to the understated lighting garnishing the edges of the Kova’s scrollwheel. It’s all there to help you, to assist you to become the best gamer you can be. The Kova AIMO’s styling is very subtle; there’s no drama, no flair here, not for a Roccat mouse at the very least. The font is refined, the logo (although still apparent) isn’t a bright, RGB light pulsing affair carved into the back of the beast, forever doomed to lie under your palm. You can tell, the design of this thing has revolved around shaving off the weight, and reducing the cost so it can hit a very specific price point. There’s no rubber grips on the side, no textured surfaces, just a flat black plastic, that, if we’re honest, is a bit too prone to smudgy fingerprints and grease than we’d like it to be. And then there’s the button layout. On the whole it’s fairly good: obviously you get your two side buttons, on either side of the mouse, because it’s ambidextrous (you know the ones usually default set to go back and forward in your internet browser). Then another two up top, located either side of the left and the right click buttons. Roccat is calling these Quick-fire top buttons, that “let you execute commands rapidly and responsibly by barely moving your finger and without needing to think twice”. We’re not so convinced on that one really, at least for our small hands, moving across to fire those buttons off was quite the stretch. Speaking of buttons, we need to talk about the left and right click switches, because boy are these things heavy. 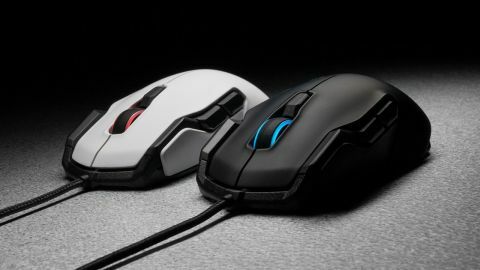 Comparing them to a Corsair M65 Pro they’re noticeably more difficult to press. There’s no documentation as to what exactly these switches are, however they certainly don’t feel like the mechanical Omrom’s we’re typically used to. Heavier clicks, means slower reaction times to press fire, and in a tense firefight, that slowdown could be the difference between victory or defeat. On top of that, the DPI switch button located above the scroll wheel, is isolated too, and it’s far too easy to accidentally hit during play, which really does mess with your game. What’s worse is because there’s only one, you then have to cycle through the DPI settings, before getting back to the one you’re used to for every-day shooting. There are 5 different DPI settings total as well, so that’s four profiles to go through before you get back to what you’re used to. A second button here, so you could skip back a profile, would make so much more sense. And then there’s the sensor. Roccat is calling it the Pro-Optic Sensor R6, with up to 7000dpi. In reality it’s a Pixart 3320DB optical sensor, with the sensitivity cranked up in software to allow for that 7000dpi. This doesn’t exactly fill us with confidence, as any form of acceleration again allows for lag and latency to be introduced into the system. The one saving grace is Roccat’s Swarm software. When we say it’s in-depth, holy cow is it in-depth. Seriously, You can alleviate the DPI button situation we had earlier, by simply deactivating the remaining three profiles. You can change how fast a double click will register, you can assign each and every button, and control the lighting, and even tell it which hand you’re using as well. The best feature has to be the voice indicator for DPI though. A smooth, manly voice quickly tells you which DPI profile you’re on when you press the button, which although a little futile (you should be able to tell dependent on how the mouse moves), is still a nice addition. All in all, the Kova AIMO is inconsistent. There’s a lot of good in it: the software, the weight, the fact it’s ambidextrous. However there’s a lot of bad too, or not necessarily bad, but areas that need improvement. The switches could be better, it needs a stronger sensor, the materials need a lot more work. Sure it’s a versatile mouse, but that versatility comes from the software package that comes along with almost all Roccat mice at this point and, if I’m honest, I’m not sure that’s enough to carry this thing through to greatness. A mouse should be capable of standing tall without the aid of software. You should just be able to plug it in, and play. Software suites should just be an added bonus. With the Kova AIMO, it fails to do that as well as it should, and given just how close some of its competitors are in price, it’s very hard for us to recommend it.